The law firm pedigree bubble is bursting. New opportunities emerge. If you’ve got 10 minutes – and an interest in the legal business – I highly recommend that you read “Bursting the Pedigree Bubble” by William Henderson, a professor at Indiana University Law School. It’s the smartest, most comprehensive piece I’ve read about the seismic shifts that are occurring in the legal industry. Henderson explains that the AmLaw 100 firms and their Harvard-trained attorneys are simply not worth the exorbitant prices they currently charge. The sluggish economy is now causing corporations to question the value that these firms offer – and this presents opportunities for everybody else. It also means that the AmLaw 100 will be forced to rethink the way that they do business. According to Henderson, the perceived value of Ivy-League pedigrees will diminish – and success will go to those attorneys and firms that show hard evidence of their ability to deliver better value. So, how do you win clients in this new business landscape? It’s all about demonstrating value. It’s no longer enough to simply tell people that you’re a superstar. You need to demonstrate it. And this means writing compelling “thought leadership” content in which you give away your best ideas. You’re back! And with great content. Thanks. 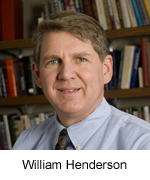 Part of our hypothesis for The Online Bar as a global legal organization is based upon what Henderson is researching. From my own experience, I have known this since I started my first firm in 1995 and I recruited an exceptionally talented lawyer from NOVA law school as a partner. In time, my first associate from Toledo law school eventually graduated to starting his own firm and became a national leader in his niche. But this is an old tale, is it not? Graet posting and right on target. There have been some some very intersecting articles written in the last week by academics on the same subject. Not only will the pedigree value of a Harvard degree diminish for the practical reasons Henderson correctly cites. Eventually, it will become irrelevant as online distribution of knowledge content transfers the brand value from the universities who, after all, became elite due to their ability to hire and pay arguably the best and brightest professors in many disciplines. Once those professors begin distributing their knowledge independently online, the big universities will suffer the same fate as have other major distributors in recent years, e.g., of music and news. Universities will no longer be the exclusive distributors of that knowledge content. Once that happens, there will be little reason to pay the outlandish cost to go to Harvard if you can get an aggregated degree from EliteProfA-EliteProfB-EliteProfC-ProfD online at a fraction of the cost (while making the EliteProfs wealthy and even more independent). Why go to Harvard when you can learn from all the best teachers worldwide? Likewise, without major changes in their economics and way they operate, don’t be surprised to see a notable percentage of the AmLaw 50 go out of business within 5-10 years. Yeah, they’ve still got the ultra-high-end work, but they’ve also got the ultra-high-end overhead. It’s said that those who ignore history are doomed to repeat it. That goes for business history, too. Thirty years ago there were 10 companies competing in the ultra-high end of the computer business: mainframes. They made terrific margins and scoffed at the minicomputer revolution, which ate their lunch in departmental computing. Then they scoffed at the desktop revolution, which took away all the need for individual workstation applications to be on the mainframe. By 1985, fewer than half the mainframe manufacturers remained. By the mid-90s, there effectively was only IBM, and IBM was well on its way to making most of its money from the sale of services, not hardware. Top-tier legal services are a product category, nothing more. And as business history continually reminds, ALL product categories eventually displace the leaders and, eventually, go away almost entirely. Only hubris would convince someone that, somehow, this category will remain immune to the phenomenon of product maturity. Wow. Thanks for your comments Mike. I think you have the beginnings of a great article here! I applaud the firms and attorneys that are innovating. From our perspective they seem to be small to mid-size firms that have a lot to gain. When it comes to marketing innovation, I think culture is the biggest hurdle to overcome for many firms/attorneys to successfully demonstrate their expertise. Networking, writing articles and blog posts, conducting webinars… these things take time, and often they do not yeild immediate results. But the funny thing is, the attorneys that consistently share their knowledge seem to be among the most successful. And today, with the internet and its many tools, demonstrating attorney expertise has never been easier. If you’re right about “a notable percentage of AmLaw 50 will go out of business”, its going to be an interesting decade. Being an optimist, I believe that firms of all sizes will change with the times (some more than others). It’s why online educational sites like Solo Practice University are thriving. Great post!